All information about the reunion has been moved to the Names page. The History of the Welcombe (part of the grounds are pictured above). The origin of the hamlet of Welcombe is lost in historical obscurity, but traces of its occupation in very early times were found in the form of Anglo-Saxon weapons discovered on the tumulus on which the Garden Wing now stands. At one time part of the Clopton family estate Welcombe passed, during Queen Elizabeth's reign, into the possesion of John Combe whose two sons, Thomas and John, were well known to Shakespeare. Shakespeare's connection with the Welcombe was established by his purchase, in 1602, from William and John Combe 107 acres of arable land in old Stratford, Bishampton and Welcombe. From Shakespeare to the present owners, the Welcombe property has passed through comparitively few hands. Shakespeare left the land to his daughter Suzanne Hall, who was succeeded by grand-daughter Elizabeth Nash, the wife of Sir John Barnard. Lady Barnard, the last descendant of the poet died in 1670. In 1774 the Welcombe had become the property of John Lloyd, a Fellow of the Royal Society. He was succeeded by his son George Lloyd and then in turn by his nephew, Charles Thomas Warde. In 1845 Warde sold the Welcombe to a Manchester businessman, Mr Mark Phillips, who actually rebuilt the house in the style we know it today. The commission to design the house went to Henry C Clutton. The building work was carried out by Thomas Newby of Manchester who actually built warehouses for the Phillips family. The construction took 4 years and the house was completed in 1869. Mr Mark Phillips had now become an MP and was the main instigator behind the movement to introduce public parks and recreation areas for the enjoyment of evryone. He died in 1874, just four years after moving into the house. The obelisk on the Welcombe Hills, very close to the hotel, was built in his memory. The house passed to Mark Phillips daughter Caroline, the wife of the Right Hon.Sir George Trevelyan. 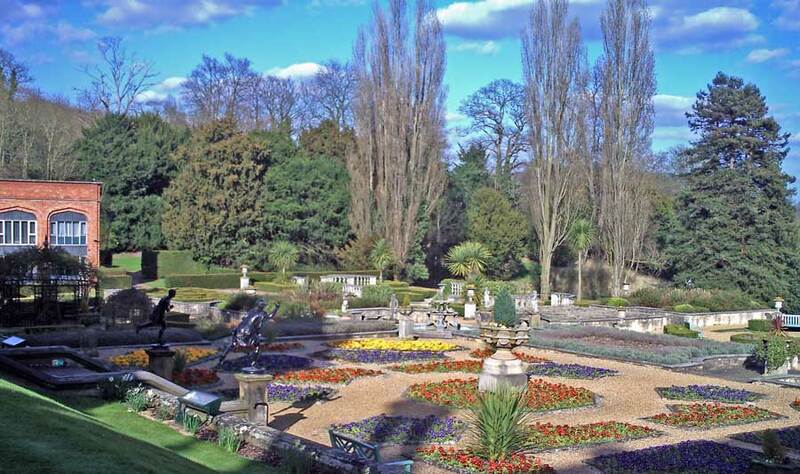 His son Robert Calverey Trevelyan sold the property to Sir Archibald Flower, the founder of the famous Flowers Brewery in Stratford upon Avon. 7 entrances, one for each day of the week. 12 fireplaces, one for each month of the year 52 chimneys, one for each week of the year 365 windows, one for each day of the year. The house was purchased by the LMS (London Midland and Scottish Railway) in 1931 and became one of their hotels - at one time one of a chain of 30. It is now owned and operated by the Menzies Group. There is also a Golf Course and Spa.